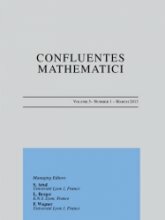 Confluentes Mathematici is a mathematical research journal, edited since 2009 by the Institut Camille Jordan and the Unité de Mathématiques Pures et Appliquées. It aims to publish high quality mathematical research articles, with a particular emphasis on papers concerning two or more distinct research areas. All domains of Mathematics (pure and applied) and Mathematical Physics will be considered, as well as the History of Mathematics. Confluentes Mathematici is an open access journal, without any Article Processing Charges. For more information, please visit its website.